Shamba Chef (www.shambachef.com) is an entertaining and educative TV and radio series that is changing the way people cook in Kenya. Shamba Chef tells the stories of real families in Kenya to highlight the dangers and discomforts of cooking with inefficient, polluting cookstoves and fuels, and raise awareness about solutions. It also introduces families to nutritious recipes and provides practical tips for sustainable and safe farm and food management. The series is broadcast weekly on Citizen TV, Kenya’s most popular station, in English and KiSwahili. Over 3 million households in Kenya tuned in on a weekly basis during its first season, making it the top-rated show in its time slot. The series is complemented by a mobile platform called iChef that viewers can SMS to get bespoke advice relating to clean cooking and nutrition. 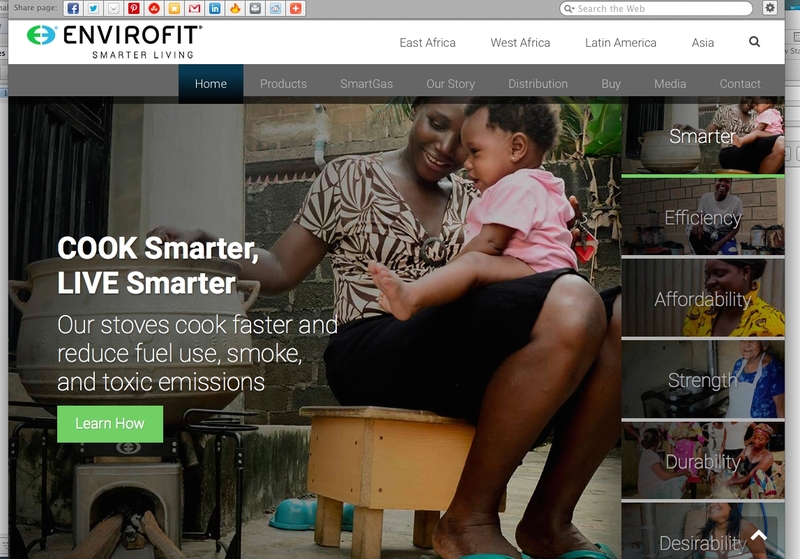 A range of technical solutions exist for addressing inefficient and polluting cooking. These include “cookstoves” that combust solid fuels like wood and charcoal more efficiently, as well as stoves that are powered by clean fuels like electricity, LP gas, biogas, ethanol and solar. Many of today’s more efficient cookstoves have been shown to reduce fuel use by 30-60%, resulting in fewer greenhouse gas and black carbon emissions and reducing impacts on the environment. Recent evidence also demonstrates that advanced (efficient and low emission) cookstoves and fuels can reduce black carbon emissions by 50-90%. Many of these cleaner cooking options are widely available in Kenya and delivered by social enterprises through a range of innovative business models. Given the natural connection between cooking practices and nutrition and food management, Shamba Chef also introduces solutions for better food sourcing, as well as trapping water and improved hygiene practices. Facilitating the transition to clean cooking requires overcoming multiple behavioral barriers. Many people are simply not aware of the various cleaner cooking options that exist, whiles others do not fully understand their benefits. Social support is also lacking in many contexts, as people see cooking over open fires and traditional stoves as the way cooking “has always been done”, as it is a practice that is passed down over generations with close ties to culture. In some cases, switching to a new stove and/or fuel requires a substantial financial investment. This requires a high level of motivation within the household to devote limited resources to investing in an often-unfamiliar product. Shamba Chef is an innovative Kenyan television and radio series that addresses these barriers by sharing the experiences of real Kenyan women in the kitchen and demonstrating solutions. In each weekly episode, challenges that are common to kitchens throughout Kenya are discussed. Viewers learn about the downsides of cooking with solid fuels as the hosts problem solve with the families and guide them through discovery of better options. The costs and benefits of various clean cooking options are clearly outlined via discussion, visual diagrams, and demonstrations, and expert guests demonstrate nutritional recipes and sustainable food management practices. 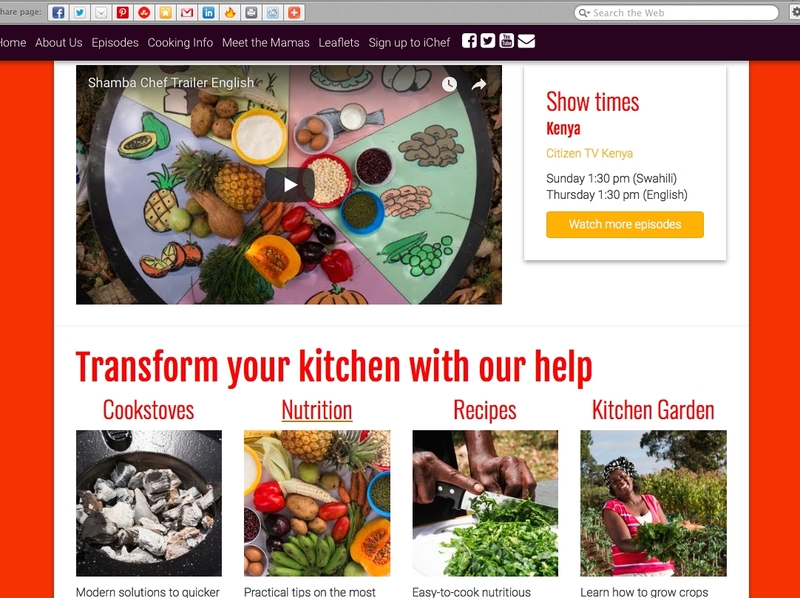 Shamba Chef increases social support for clean cooking by featuring real Kenyan women who viewers can identify with, and invites viewers to follow along on their journey as they make the switch to the desired behavior. The series also engages men as key decision makers within households, and portrays them as modern men and responsible fathers when they support their wives in cooking with a new stove or fuel. Shamba Chef is a reality style television and radio series which uses various entertaining elements to sustain viewers’ interest while conveying information about clean cooking and nutrition. A team of chefs, nutritionists and agronomists travel across Kenya visiting families in their homes, offering advice to improve the quality of cooking experiences. 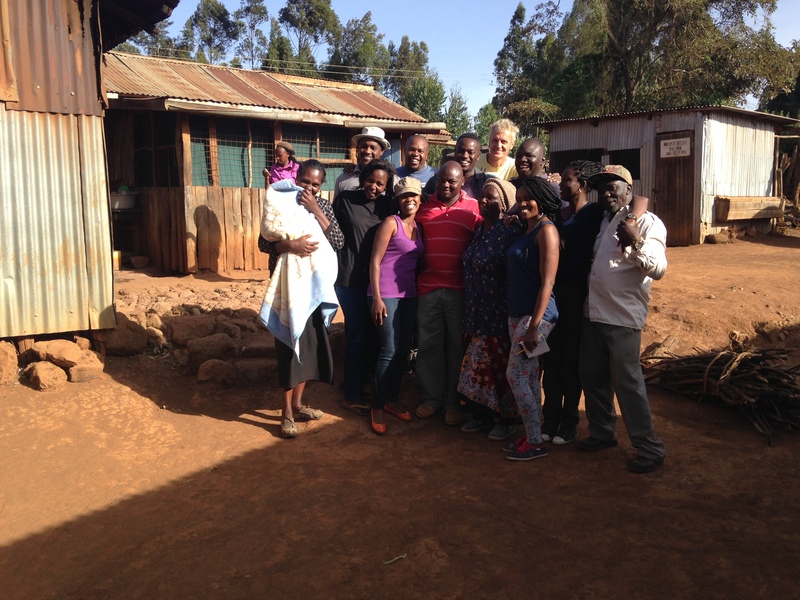 The series engages audiences with appearances by popular Kenyan chefs who share recipes using local ingredients, getting neighbors and families together for “cook-offs” where they compete to make the tastiest and most nutritious meals, and showcasing before and after kitchen make-overs. All while conveying important information about nutrition and cleaner cooking. The TV series airs weekly on Citizen TV, Kenya’s most popular TV station, in both English and Swahili. Programmes attracted on average 3 million household viewing each week. Each episode is also adapted for a weekly radio series. Shamba Chef is complemented by iChef, a mobile based information service that offers subscribers a call centre plus weekly SMS tips and access to printed leaflets and mobile internet access to healthy recipes, kitchen garden and nutrition tips, and guidance on how and where to buy clean cookstoves. The iChef platform received over 42,000 SMSs requests for advice during programme transmission, 64% of which came from women. 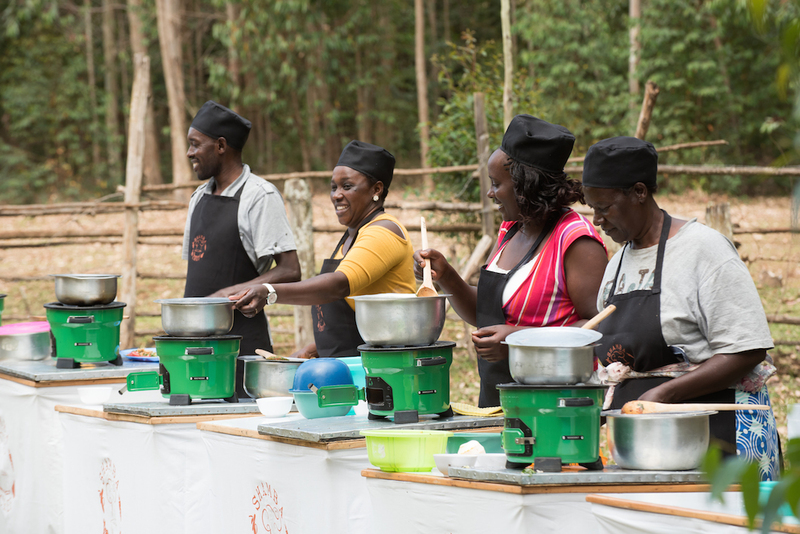 Shamba Chef was created with support from the Global Alliance for Clean Cookstoves (Alliance). The Alliance works with a strong network of public, private and non-profit partners to accelerate the production, deployment, and use of clean and efficient cookstoves and fuels in developing countries. Mediae Ltd. collaborated closely with Alliance partners in Kenya, including stove and fuel producers and distributors, researchers, nutrition experts, and NGOs to develop the key themes and content. Experts in clean cooking and nutrition appear regularly on the show as advisors on the various topics and approaches. Representatives from multiple lending organizations also appeared on the show to discuss ways people could access financing to purchase a clean stove. This included one of East Africa’s largest banks, which recently launched a loan facility specifically for clean energy products like cookstoves. More than 3 million households tuned into Shamba Chef on a weekly basis during its first season, and millions more listened to its sister radio program (Source: Geopoll, 2017). The Shamba Chef team received over 42,000 SMS requesting additional information about how to access the cooking products and recipes featured in the show, 64% of which came from women. Initial results from an external impact assessment indicate a high level of recall of the series among randomly sampled survey respondents, with over 40% of the sample reporting either watching or listening to the Shamba Chef series. Final analysis from the assessment will be available in later 2018. All of the companies whose products were featured on the show reported increased sales during the period when the first season was on air. One leading clean cookstove company in Kenya reported that after their product was featured on an episode of Shamba Chef, there was an overnight surge in inquiries about their products. By sharing the experiences of real Kenyan women in the kitchen, Shamba Chef inspires Kenyans to make changes to their cooking practices and diets, thereby improving the health and well-being of their families. Reliance on inefficient stoves can create a persistent time and economic poverty trap, which has disproportional negative effects on women. By gaining access to cleaner and more efficient cookstoves and fuels, women also have more time to engage in other productive activities that lead to greater economic empowerment and gender parity. An additional theme featuring Shamba Chef includes water conservation – a key component in mitigating climate change. Water saving technologies are featured in the show; for example, trapping rain water, solar pumps and an affordable and efficient drip irrigation technology is demonstrated on a woman’s kitchen garden where she grows vegetables with which to feed her family. This enables her to prepare nutritious vegetables in a productive, cost effective way. Shamba Chef was developed in close collaboration with the Global Alliance for Clean Cookstoves, which seeks to facilitate sustainable, market-based clean cooking solutions. The products promoted on the show are all available for purchase at commercial outlets. While the initial season of Shamba Chef was supported through a grant from the Alliance, future seasons will be funded by additional sponsors given the demonstrated audience interest from season one. These will include donor organisations, NGOs, research bodies and the commercial sector – all of whom wish to reach large rural, predominantly female audiences in Kenya. Shamba Chef built from a proven model that has been used previously to promote improved agricultural practices in Kenya. 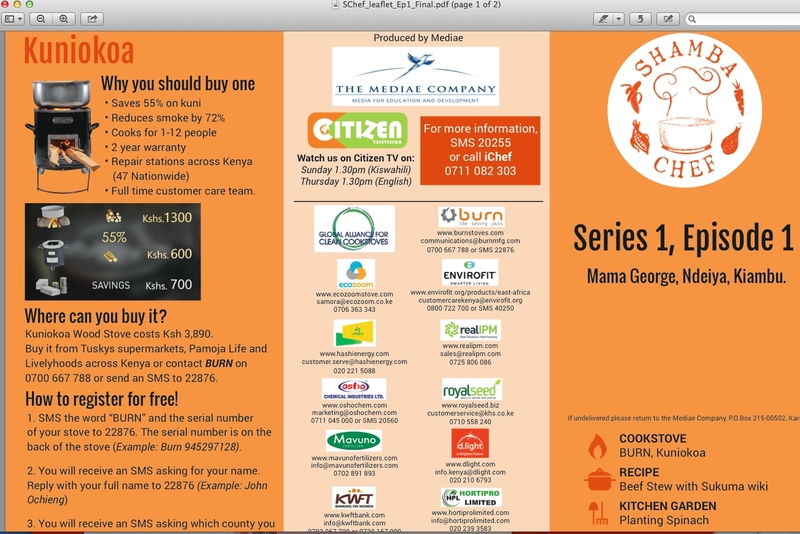 Mediae’s flagship series, Shamba Shape Up, is the leading agricultural TV program in East Africa. Now in its ninth season, it reaches up to 3 million viewers weekly. Research shows that Shamba Shape Up is one of the most trusted sources of agricultural advice for Kenyan farmers; in 2014, 87% of viewers reported learning something new, and 45% of the audience adopted a new practice that was demonstrated on the show. Shamba Chef builds closely from Shamba Shape Up- focusing on real people and visiting real farms, and engaging experts to discuss and demonstrate solutions. It also adapts best practices from a range of popular reality shows from around the world – incorporating celebrities, before and after makeover reveals, recipe demonstrations, and competitions. These types of approaches could be replicated for a range of solutions anywhere in the world.